Happy sweet 16. Welcome home from Iraq. Come listen to my band at Snapper Jack’s. 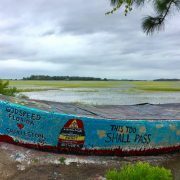 Whatever your message is, it’s probably been written on the so-called Folly Boat, located just past the Piggly Wiggly on Folly Road. The Folly Boat arrived at its present land-locked location sometime during Hurricane Hugo, and after nobody stepped up to claim it, some creative soul noticed the advantageous angle of its hull to passing cars and covered it with art. It wasn’t long before someone else came along and added their own work of art. Estridge says that the city doesn’t own the small strip of land along the causeway that supports Folly Road, and calls to Charleston County were inconclusive in determining a landowner. The County’s land map lists 41 different tax ID numbers on the mostly salt marsh parcel. “We just tell people to go ahead and do it,” Estridge says. 1. Park in the grass, well off of Folly Road. Get your car out of the right-of-way and you should be legal (and safe). 2. Take your paint cans with you when you leave. A half empty can of paint left in a salt marsh is worse than litter — it’s a direct attack on every oyster shucker in the Lowcountry. 3. Don’t paint the road. It’s illegal and it’s not safe. After two decades of nearly daily paint jobs, there’s bound to be some spillage. That’s a small price to pay for the joy beachgoers and locals get when they drive by to discover a mural of dolphins or orcas, or a fond farewell to a fallen friend. 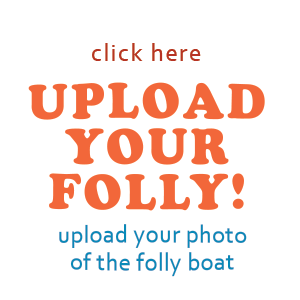 There’s even a Facebook page (“Folly Boat”) with 7,440 “Likes” and a website where you can document your boat creation in perpetuity (follyboat.com). You don’t have to wait for a special occasion to get your tag on. If an image appears in your head, grab some paint, brushes, and a friend or two and head out to the Folly Boat. Just remember to take a picture before you drive away, because inspiration will likely strike someone else tomorrow. CNN :: "Hurricane Irma Washes Away Iconic Boat"
P&C: "Folly Boat, a Charleston Icon, Washed Away"